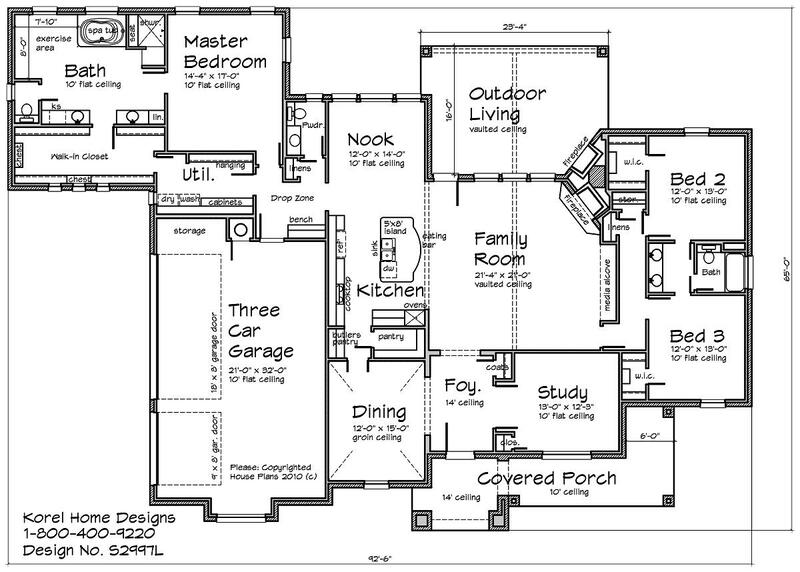 I have a smaller version of this plan as S2750L and a 4 Bedroom version with Play Room S3112L. A Country Home Design with large rooms including an Outdoor Living Area. All Bedrooms have Walk-in Closets and 10′ flat ceilings. Your Kitchen has a huge open area with a 5′ x 8′ Island with eating bar and Kitchen sink. There is also a Butler’s Pantry between the Kitchen and Dining Room including a Walk-in Food Pantry. You have an oversized Utility Room with clothes hanging along one wall. The Master Bath has a 72×42 Spa Tub, Walk-in Shower, a space for your treadmill, separate vanities, and a huge Walk-in Closet that has a door into the Utility Room. All ceilings are 10′ flat other than the Family Room and Outdoor Living Room that has is vaulted. The Foyer has a 14′ flat ceiling and your Dining Room has a Groin Ceiling. Front to back roof pitch is 8/12 while the front gables are 12/12. The metal area of the Front Porch is 5/12 pitch. To order this plan call us at 1-800-400-9220.